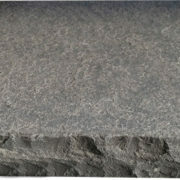 Stones can be cut with different edge and finish treatments (see below). Custom cut products are special order. Please call for a quote. Penciled – A Penciled edge resembles the end of a pencil eraser with slight radius. 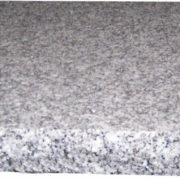 Chamfered – A Chamfered edge is 45 degree cut into the edge of the stone. The deeper the cut, the wider the bevel face is. 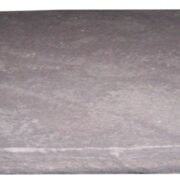 Eased – This edge treatment is very common and offers a clean and simple look. Easing an edge offers a square flat face with the sharp edge on top rounded slightly. 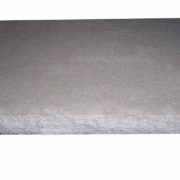 Sometimes, the eased edge is rounded enough to be called a quarter round edge. Thermaled – The Thermal finish is produced by applying a high-temperature torch to the surface of the stone leaving a rough-textured finish. Full or Half Bull-nosed – The full bull-nose offers perhaps the most contemporary look. A side view of full bull-nose shows the shape of a half circle. The full bull-nose is gentle on the body and has no edges to chip. The half bull-nose edge can also be called the round-over because instead of being squared off, it is rounded over. 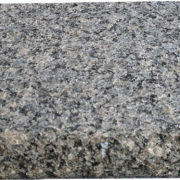 Rockfaced – The Rockfaced edge finish is produced by striking the stone surface with a chisel leaving a rough natural edge finish. Thermaled – The Thermal finish is produced by applying a high-temperature torch to the surface of the stone leaving a rough-textured finish. 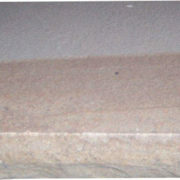 Highly skid-resistant, this finish is an excellent choice for walking surfaces. 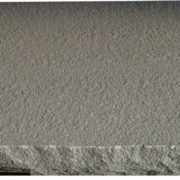 Honed – A smooth, satin surface without reflection, the Honed finish shows the full color of the stone. It is produced on the same equipment as the polished finishes however, the honing process ends prior to the buffing stage. 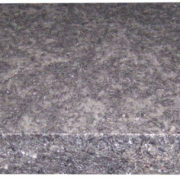 Polished (granites only) – The Polished finish is a highly reflective, mirror gloss finish. 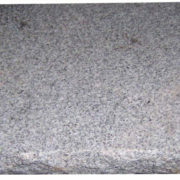 The full color, depth and crystal structure of the stone is visible. A polished finish seals surface pores and is therefore nearly impervious to chemical wear and weather.